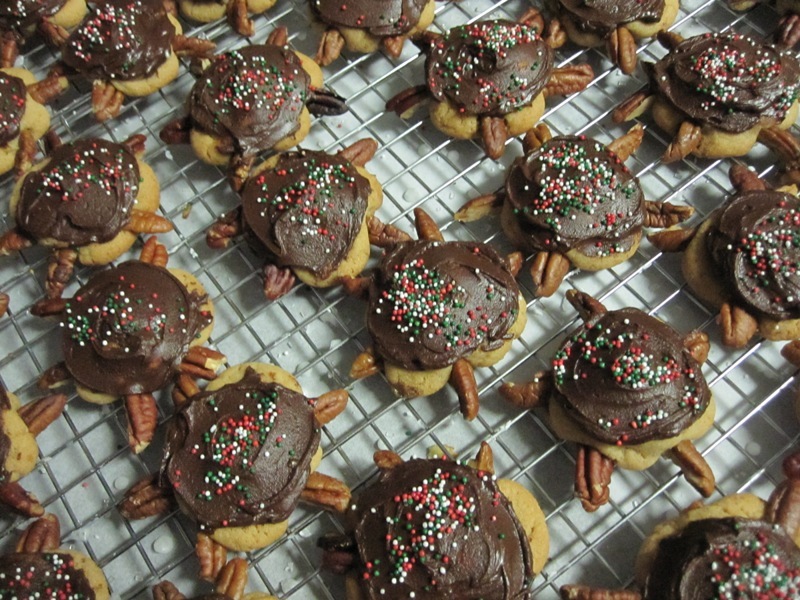 Snapper Cookies | Rosetta Bakes! Beat butter and peanut butter in a large mixing bowl with an electric mixer on medium to high speed for 30 seconds. Gradually add granulated sugar and brown sugar, baking soda and baking powder and mix until combined, scraping sides of bowl occasionally. Beat in egg and vanilla until combined. Beat in as much of the flour on low as you can. Stir in remaining flour and cover dough and chill in fridge for 1 – 2 hours. Cut candy into rectangles along scored lines. Cut each into a rectangle along scored lines. Cut each in half crosswise and stack each set of halves. Shape dough into 1 inch balls and wrap around each candy stack. Place on an ungreased cookie sheet (I use parchment paper). Tuck 3 pecan halves under each ball. Bake 375 for 9 – 10 minutes. Melt chocolate pieces and shortening in a heavy saucepan over low hear. Spread a little over each cookie. Makes 48.